The great luxury liners were never more glamorous and exciting than on the day of departure. As passengers arrived and the final provisions were loaded on board, scarlet-jacketed bellboys hurried back and forth to the cabins, delivering flowers, telegrams and champagne. And when the tugboats began to nudge the leviathan from her berth, brightly-colored streamers rained down from the upper decks onto the crowd shouting “bon voyage” from the pier. I witnessed this spectacle firsthand, sailing to Europe with my parents in the spring of 1959. At the time, it was not unusual to travel by ship; half of the people who crossed the Atlantic that year did so by sea. And there was arguably no better way than to book passage on the S. S. Liberté, the flagship of the French Line, renowned for its palatial Art Deco interiors and fine cuisine.1 During my week aboard this ship, there were two things that were particularly memorable; having the meal of my dreams and catching occasional glimpses of one of our fellow passengers, a stripper named Tempest Storm. At the age of thirty-one, Tempest Storm was a voluptuous redhead; you simply couldn’t miss her. As a burlesque queen, she was said to be in a league with the likes of Lili St. Cyr, Sally Rand, and Blaze Starr.2 Adding to her fame, she had recently been in the news when Lloyd’s of London insured her breasts—“moneymakers” as she called them—for a whopping one million dollars. And while there was much we did not know about her then—she would later claim to have been romantically involved with JFK, Elvis Presley, and the gangster Mickey Cohen—her presence on the ship was titillating. However, Tempest Storm was nowhere in sight one morning when I had an unforgettable breakfast. 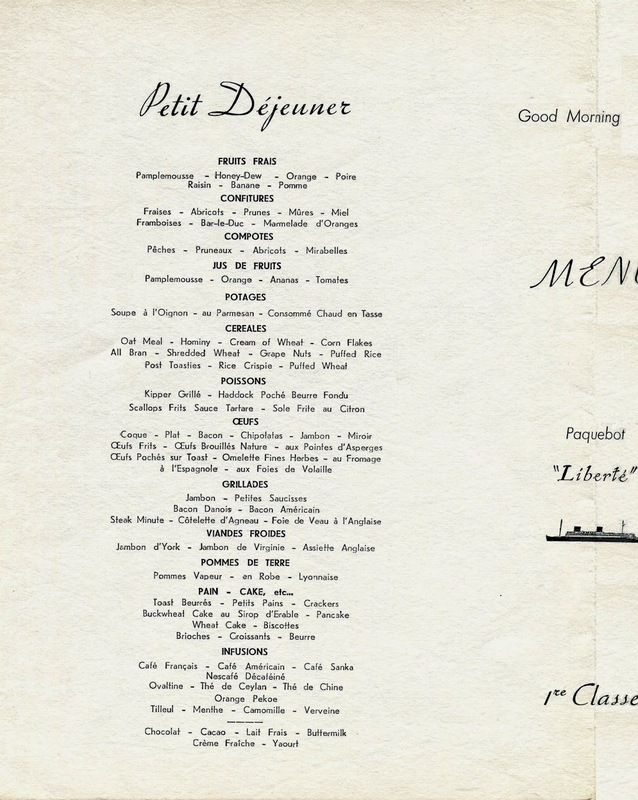 Although the bilingual menu saved from that journey seemingly offers everything, it represented only the tip of the iceberg of what was available, if one just used his or her imagination. Ms. Storm (she legally adopted her stage name) did not show up for breakfast on the third day at sea. In fact, the first-class dining room was so empty that morning that I asked the waiter why no one was there. He explained that most passengers typically ate so much during the crossing that they needed a break at this point and let their digestive systems catch up. The chefs and bakers understood this pattern of behavior and planned accordingly. His explanation made sense, for even my parents had decided to forgo breakfast. As you might expect, this rule of thumb did not apply to someone like myself who had not yet turned thirteen. Indeed, I was hungry and while looking over this menu, I began to envision the breakfast I had seen three years earlier in the movie Giant. The image still sizzled in my mind’s eye—a sunny-side-up egg sitting atop a glistening steak. With no adult supervision in sight, I ordered this extravagant dish, describing it in detail to the waiter who casually responded “Oui, monsieur,” as if my request was the most normal thing in the world. When breakfast came, it looked and tasted like…well, like steak and eggs. Somehow the dish didn’t measure up to my expectations. I reasoned that skilled French chefs, no matter how well intentioned, didn’t understand the way food was prepared on a Texas ranch, and only later came to realize that things always look better in the movies. Had Tempest Storm been at breakfast that morning, and taken an interest in the young trencherman chowing down at a nearby table, she could have taught me a thing or two about the unrestrained pleasures of the imagination, for she earned her very living as a fantasy. Now 86, Tempest Storm is surprisingly active promoting her celebrity on Facebook and Twitter. When I recently used this opportunity to inquire why she went on that particular voyage, Ms. Storm informed me that she was then going to Paris on her honeymoon with fourth-husband Herb Jeffries, a singer with the Duke Ellington Orchestra and cowboy movie actor. The following year, more people flew over the Atlantic than crossed it by sea. For the first time, less than half the people traveling to Europe could say that “getting there was half the fun.” In 1961, the Liberté made her final trip to the Continent, fleetingly captured in rare footage below. 1. The Liberté began work on the transatlantic route in 1928 as the Europa for the Norddeutsche Lloyd line. 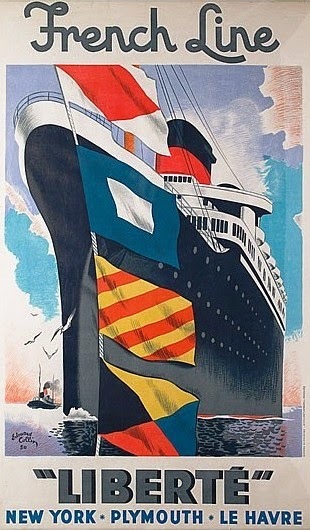 Transferred to France after the Second World War, the German liner was refitted by the Compagnie Générale Transatlantique as a replacement for the Normandie. 2. The G-strings of these legendary bump-and-grinders are now enshrined in the Burlesque Hall of Fame in downtown Las Vegas. Tempest Storm also appeared in the 1955 movie Teasearama, comprising a compilation of burlesque acts. 3. My thanks to the blog Java’s Journey, where it is noted there are two breakfast scenes in the 1956 movie Giant. The first one, comprising fluffy eggs and a single piece of bacon, takes place at the childhood home of Leslie (Elizabeth Taylor) in Maryland. 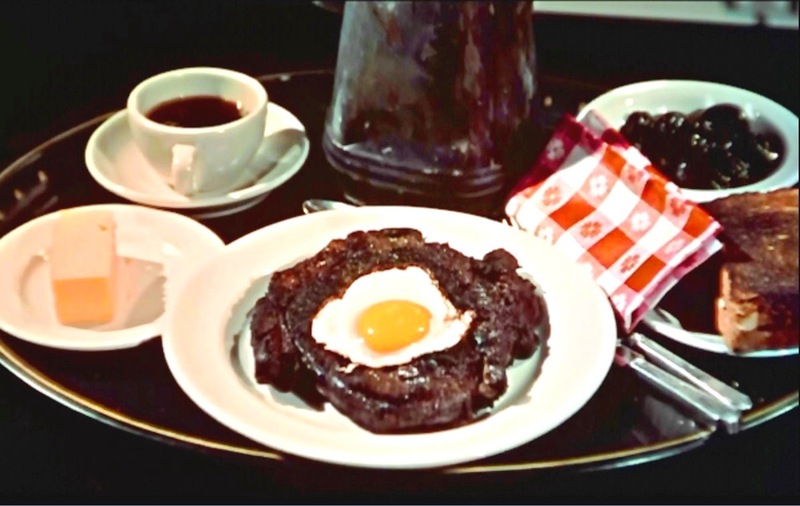 Later, when Leslie is married to Jordan (Rock Hudson) and living in Texas, there is a breakfast featuring a large steak with an egg on it. 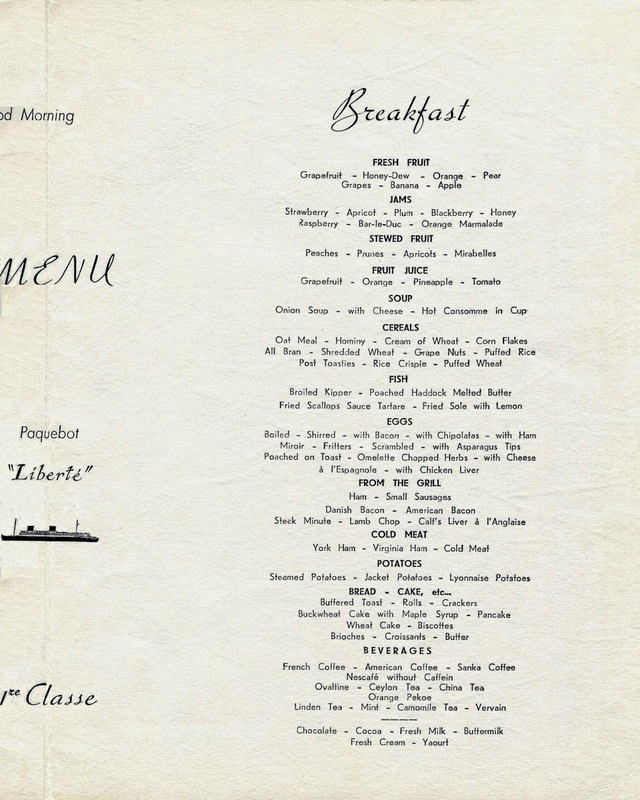 The contrast between the two breakfasts, and the different paces at which they are eaten, represented the cultural divide between Leslie and Jordan. Henry -- what a charming story! Charming indeed but Henry, I was hoping you could elucidate on the difference between American and Danish bacon. The too I can't blame you for going all out, a liner like that was no diner! Wow, I wish I could write like you! I enjoy your post so much and admire all the research and hard work that goes into them. 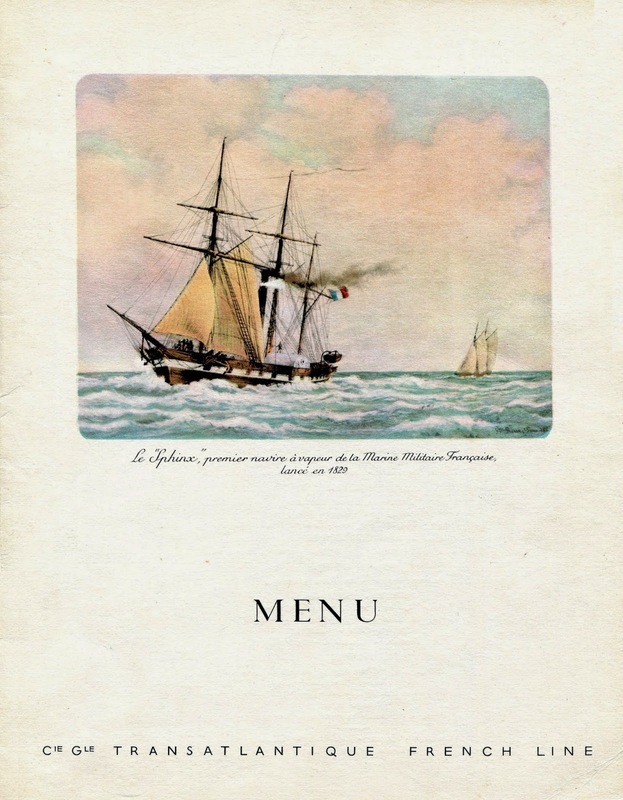 I of course am partial to your steamship menus! Keep them coming and I hope to meet you some day. My family and I emigrated from England to the US in 1957 aboard the SS Liberte. I'd love to get a copy of the picture you have in this post. Any idea where I could do that? Thanks for any help you could provide. Thanks for making my day. Read this while eating my breakfast (yogurt & fruit), but could literally see you sitting in that dining room.